He was born of very mean parents at Walpole, in Norfolk, and in his youth carried about little peddling wares which he sold in villages. Having by degrees improved his stock, he frequented cities and fairs, and made several voyages by sea to traffic in Scotland. 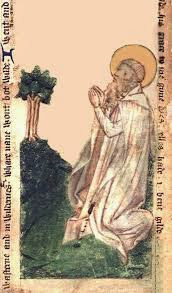 In one of these he called at Holy Island, or Lindisfarne, where he was charmed and exceedingly edified with the retirement and religious deportment of the monks, and especially with the account which they gave him of the wonderful life of St. Cuthbert. He inquired of them every particular relating to him, visited every corner of that holy solitude and of the neighboring isle of Fame, and falling on his knees, prayed with many tears for grace to imitate the fervor of that saint in serving God, resolving for that purpose to give up all earthly pretensions. He entered upon a new course of life by a penitential devout pilgrimage to Jerusalem, and visited Compostella in his way home. After his return into Norfolk, he accepted the charge of house-steward in the family of a very rich man. The servants were not very regular, and for their private junketings often trespassed upon their neighbors. Godrick finding he was not able to prevent these injustices, and that the nobleman took no notice of his complaints about them, being easy so long as he was no sufferer himself, left his place for fear of being involved in the guilt of such an injustice.